Hello girls, hope your all good. I have a very embarrassing confession to make..I fell asleep at 7.00pm yesterday. What is wrong with me? I feel like an old person..I might have to do the good old 'it's cold' excuse. Anyway, I'm starting with this outfit I've put together today. The top I showed, is in yesterdays post from H&M for £3.99 and the skirt is also from H&M for £7.99. I think it works really well together and I'm going to try and buy it this week! I think we all deserve a small treat right? I specifically put the Nars metallic eyeshadow and Essie nail varnish because these two shades are back for this new season. Berry shades are in for Autumn this year and I couldn't be happier! I love dark berry shades because they really add sophistication to your outfit. Barry M does a similar berry shade for only £2.99. For eyeshadow this season, metallic tones are said to be the next big craze. Of course you can wear silver or gold but for my brown eyes, I would personally look better with gold metallic shades. Either way I'm so excited for this trend to be back in season! 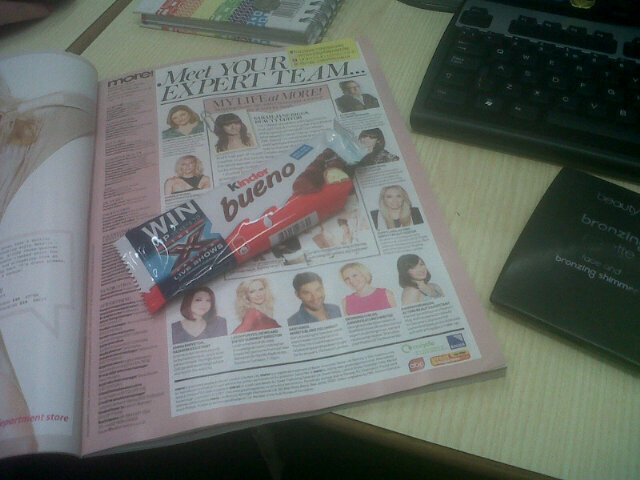 Right now I'm eating my Kinder Bueno while reading this weeks More! I definitely recommend you grab this issue, they've done a feature on how to copy celeb style. Including my favourites: Kim K, Victoria Beckham, Mollie King and Leighton Messter. They also have Lydia Bright from The Only Way Is Essex, but before you set Anna Wintour on me, I actually really like her style! Her fashion sense is so unique and classy. I'll definitely do a inspired look by her this week. You can find all of this outfit from Miss Selfridge - Result! I love the whole wish list outfit combo and that Essie nail colour is beautiful! I want those boots! Keep being your fabulous self darling. Kinder all the way, I love it. I love this outfit! Was surprisedd that the skirt and top were from h&m, dunno why really. I especially love the skirt. Lydia's style definitely gets a massive 'YES' from me!! I'm obsessed with TOWIE but I do really enjoy looking out for what Lydia's wearing. How gorgeous were the shoes Arg bought her at the opening of her shop btw?? Can't believe he has good taste in women's shoes too haha.